Creation and use of placeholders, whether levels, 3d models, sprites or sounds, has a number of advantages when developing computer games. In this article I discuss some aspects of the use of placeholders in games. Placeholders are an excellent way to support code development without waiting on asset completion. Using placeholder graphics decouples programming and art schedules, allowing them to progress independently of each other. By using quick and effective placeholders, the coders can get to work on what’s important without being held back waiting on final assets to be finished. The coders can then put in revised assets when they become available – just make sure you don’t leave any placeholders behind. An industry professional once told me how they “borrowed” some models from a very similar game to the one they were making at the time and accidentally shipped the demo with the hijacked assets! High poly models or detailed assets can take a long time to create and when you’re trying to prove the feasibility of a project you’re often more interested in the technical side. When trying to decide if what you might attempt is technically feasible in your environment and time constraints, you may find that when building a proof of concept you just want some quick assets to put in so that you can continue to focus on building up the code. In terms of pre-production, placeholder art can be very important just to get a working build. I was recently at the Microsoft X48 competition, where we coded a game in 7 and a half hours. When developing, our artist mercilessly took Google images and made graphics by tweaking them in Photoshop. Our focus here was not to make a pretty game, but to get a working build as fast as possible. Placeholders also are a great way to carry out tolerance testing when trying to work out how high poly you can make scenes for example. It would waste a lot of time for the artists to not know how detailed to make their 3d models and what limitations there are on the type of material properties they can use. By using placeholders that simulate the sort of poly counts and shaders that you want to support you can figure out the tolerances of your game engine, what you need to optimise and what the artists need to be limited to. While placeholders mean that you can get the basic look and feel of your target environment without the full development time, they can also work to your detriment. It can be demotivating to see your project littered with ugly placeholders. Most games go the extra mile in creating the fun factor by rewarding visuals and involving graphical finesse. 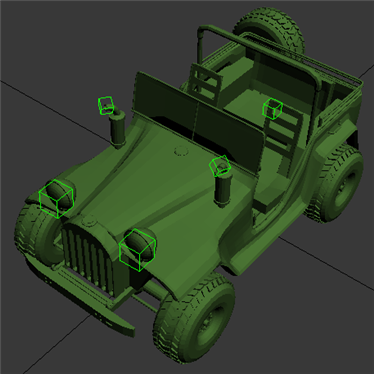 Likewise placeholders can create issues for the team, the designers may not know how the physics of a vehicle may work when the vehicle has not yet gone beyond being implemented as a placeholder, which of course must be understood for a more balanced and smoother level. When Half Life 2 was being developed, the developers took a new approach. Separating art from design in the level creation, the designers would flesh out the gameplay before the team of artists made the levels look pretty. The initial stage in level production was to create an “orange map”, where the entire level’s textures were orange. The result of this meant that the team could test and perfect gameplay, script in any necessary elements and let the programmers work on what would become finalised levels without waiting for the art pipeline to be completed (or indeed necessitate the start of art development.) The result was a much more rapid and smoother development process, as designers involved in play-testing, tweaking and working out where those big, beasty enemies should jump out can do their work equally well in either a Sunny-D environment or a fancy multitextured and materialed environment. Depending on your development environment (and in the case of studios), you may have either the programmer developing the placeholders or the 3D artist. I know a few triple A studios where they won’t even let their programmers have 3ds max installed in case they start making placeholder graphics, leaving this task to be done by the 3d artists.However, depending on your environment this may not be feasible or desirable. Depending on the organisation, it may be the 3d artists or the programmer who creates the placeholder, this is more of a managerial decision and each has its pros and cons. I hope this article has been an interesting read, as usual comments and criticism are appreciated. If you can suggest any improvements I can make, I’ll be happy to change the article. Keighley, G. (2004). The Final Hours of Half-Life 2. Available: http://uk.gamespot.com/features/6112889/index.html. Last accessed 28 March 2010. Recently I’ve been doing tools development, something I’ve done a lot of in the past when reverse engineering Dune 2000 (an old RTS.) I’ve learnt some interesting lessons in tools development, which I thought I’d share with you. Firstly, the most important part of tools development is seeing how the end user will use it and making it as easy as possible for them. When developing a series of tools for our artists, I’d frequently speak to them, going through the work process and how they feel it should flow. Make sure the tools you develop are suited to the intended target. Everything should be kept straightforward, easy and quick (and obvious). Too many programs have massively complicated user interfaces which can be completely baffling. It’s worth spending time working on the design of the program and the structure whether that’s on paper or on a graphics package. The last tool I wrote I mocked up quickly in Photoshop what it would look like and drew the class structures on paper, before touching a line of code. This helps you think about how to make the program well structured and come across potential problems before they become an issue. It’s important to make everything fluid, support dragging and dropping of files rather than forcing a rather more cumbersome process of being locked in to the windows open file dialog box. If your user is applying a texture to a shader for example, let them drag it straight in from Windows Explorer, it makes things quick and easy. Auto focus helps keep the flow going with tool usage, having to keep reselecting the same option because the program forgets gets frustrating quickly. In a similar fashion if you have a list of items in a menu, let them be dragged up and down rather than requiring a button to be pressed each time you want to move the item up one. Following on from this idea, a good rule of thumb is to keep functionality down to as few clicks as possible, this way your end users will be able to work more productively. Shortcuts are also good at speeding things up, but should never be the exclusive way to carry out an action. Most modelling packages for example have many ways to achieve the same task. Less clicks is a fundamental improvement and goal for tools, people spend half their lives clicking through menu after menu. The objective of a good tool is to cut this down to a minimum. Keep the user interface clean and clear of clutter. Icons can be very helpful, but what they represent need to be easily recognisable at a glance. Adopting common icon designs is definitely a great idea, using a floppy disk icon for saving and an open folder for opening a file for example. Everyone knows what they mean, resulting in a quicker learning curve. When development of the tool becomes held back by poor or a changed design, it’s time to have a think, work out the optimal structure and recode the tool. Frequently I’ve wasted more time trying to make code work which is broken from poor design, than it would have taken me to change the structure and reimplement the code. I find an iterative approach to this development very helpful, the first design is rarely optimal and you’ll learn from each iteration. I also believe in the Unix ethos of developing small targeted use applications as opposed to über programs which attempt to be a jack of all trades but result in being a master of none. My experience of the asset production pipeline is that dedicated tools which each accomplish a job is a much more favourable approach, for example creating a mesh in Lightwave, shipping it off to Zbrush to be sculpted, then taking it into Topogun to create a lower poly version, baking the high poly to normal maps, tweaking in Lightwave again, generating maps with XNormal, then exporting to FBX via 3ds max (Lightwave’s FBX exported is supposedly pants). This is more an issue of personal taste and indeed there are a lot of different systems out there for the way different parts of an application are presented. Recently I’ve gotten into using floating windows, if I want to bring up the properties of a mesh for example, I find it far more useful having that as a separate window. Windows can then be resized and moved about, your preview window can be maximized on a second monitor for example. Then the layout can be saved and preserved, allowing a lot of flexibility for the end user. Make tools that are easily extendible, with readable and editable configuration files. Custom user configuration helps makes people life’s easier, having the capability to change their preferences to something they find more suitable. We don’t all like the same layouts or colours, so supporting user changes will make people’s time less painful. Usage of existing and established file formats can be very useful. I like to use XML where appropriate (although I change the extension) as it makes serialization and deserialization very easy, tends to generate readable files and allows quick editing in a program like Notepad++ (or just Notepad). As a standardised system, it also means someone else can pick up your files and understand how they’re structured – which is certainly more involved with a custom or binary format. An alternative to XML is JSON, which provides a lightweight alternative that my friend swears by. It can also give a lot more flexibility when adhering to an established standard when storing other data, such as images and models. While using established standards for storing any kind of data can be extremely helpful and effective, it does carry with it a potential inherent problem. By adhering to standards, you are limiting what you can do to what the standard supports. In the case of XML this may not be such an issue as its a very versatile markup language, however locking yourself in to an image or 3d model format can be extremely limiting. To get past this, you could extend or encapsulate the format or simply see if there is an alternative which is better suited. To sum up, planning and design with an iterative approach allows for speedy development of tools. Keeping things extendible and configurable means the user can keep things the way they prefer, while constantly looking to streamline the flow of usage speeds up tool use and improves productivity.